The recent debate about who should be the new Federal Reserve governor has made me think about the general misperception that a good central bank governor is a good “crisis manager”. “Summers knows how to manage a crisis. This White House is particularly attuned to the idea that the economy can fall apart at any moment. Summers, they think, knows what to do when that happens. He was at the center of the Clinton administration’s efforts to fight back the various emerging-markets crises of the 1990s (remember “The Committee to Save the World”?). He was core to the Obama administration’s efforts to fight the financial crisis in 2009 and 2010. Few people on earth are as experienced at dealing with financial crises — both of the domestic and international variety — as Summers. What is wrong with this argument? First, of all the assumption is that crisis is a result of the market economy’s inherent instability and that the regulators’ and the central bankers’ role is to somehow correct these failures. There is no doubt that central bankers like this image as saviours of the world. However, history shows that again and again we are in fact talking about firefighter arsonists – central banks again and again have caused crisis and afterwards been hailed as the firefighters who flew in and saved the world. Just take the ECB’s actions of the last couple of years. The introduction of the so-called OMT program is often said to have ended the fire that was (is) the euro zone crisis. But why did we have a euro crisis to begin with? Well, it is pretty hard to get around fact that the ECB’s two rate hikes in 2011 played a very significant role in igniting the crisis in the first place. So is the ECB a firefighter or an arsonist? Second, describing central bankers as crisis managers and firefighters exactly defines monetary policy as first of all a highly discretionary discipline. There are no rules to follow. A crisis suddenly erupts and the clever and imaginative crisis manager – a Larry Summers style person – flies in and saves the day. This is often done with the introduction of enormous amounts of moral hazard into the global financial system. This has certainly been the case during the Great Recession and it was certainly also the case when Summers was on “The Committee to Save the World”. Did the “The Committee to Save the World” actually save the world or did it introduce a lot more moral hazard into the global financial system? We need to stop thinking of central bankers as crisis managers. They are not crisis managers and to the extent they try to be crisis managers they are not necessarily good crisis managers. As long as there is a monopoly on money issuance the central bank’s role is to ensure nominal stability and act of as lender of last resort. Nothing more than that. To the extent the central bank should play a role in a crisis it should ensure nominal stability by providing an elastic supply of money. Hence, in the event of a drop in money velocity the central bank should increase the money base to stabilize nominal GDP. Second, the central bank shall act as lender-of-last resort and provide liquidity against proper collateral. Those are the core central bank tasks. Often central banks have failed on these key roles – the Fed certainly failed on that in 2008 when the Primary Dealer system broke down and the Fed effectively failed to act as a lender-of-last resort and allowed money-velocity to collapse without increasing the money base enough to offset it. On the other hand the Fed got involved in tasks that it should never have gotten itself into – such as bank rescue and credit policies. A stable monetary and financial system is strictly rule based. There should be very clear rules for what tasks the central bank are undertaking and how they are doing it. The central bank’s reaction function should be clearly defined. Furthermore, bank resolution, supervision and enforcement of capital requirements etc. should also be strictly rule based. If we have a strictly rule based monetary policy and rule-based financial regulation (for example very clearly defined norms for banking resolution) then we will strongly reduce the risk of economic and financial crisis in the first place. That would completely eliminate the argument for central banking firefighters. Public Choice theory, however, tells us that that might not be in the interest of firefighters – because why would we need firefighters if there are not fires? Hence, the firefighters created the conditions for the Asian crisis and following stock market bubble. And we should remember that today. Because central bankers over the past five years have acted as discretionary firefighters (the Larry Summers playbook) they rather than acting within a rule based monetary policy framework might instead very well have laid the foundation for the next crisis by further increasing moral hazard problems in the global financial system. Paradoxically enough central bankers have been extremely reluctant about doing what they are meant to do – ensuring nominal stability by providing an elastic money supply – but have happily ventured into credit policies and bailouts. PS Given the discussion some might be wrongly led to conclude that I think monetary easing is the same as moral hazard. That, however, is not the case. See a discussion of that topic here. We have had too tight monetary policy in the euro zone and the US in the past five years, but far too much credit policy and too much moral hazard. A reminder: Make sure the monetary policy rules in place allow enough room for economies to breathe. Paul Volcker recently penned a pice for the NY Review of Books. in it, he suggests that central banks (the Fed) be relieved of the noisome “dual mandate” so that the Fed can concentrate on their nirvana, and this is price stability. Over and over again, in the last 30 years, we see central bankers—grated independence—then migrating to the position that their only concern is price stability. I can see why. Taking responsibility also for growth is messy, can lead to criticism. But price stability is easy. Just put the noose around the eocnoy’s neck and tighten. Or, is it too strong to say, [put the central banker hobnailed boot not he economy’s throat. Voila! P4rice stability. Growth? That is the problem of the legislature and all the structural impediments they create. Blog post of the day. Could not agree more! 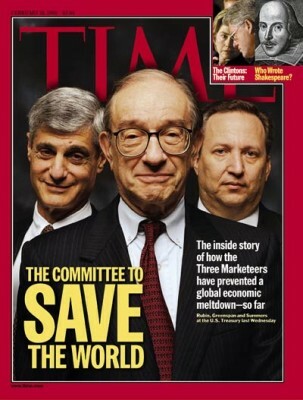 I also agree, but would say that Greenspan was in some sense a true firefighter in 1987 and in the sovereign defaults. Of course to the extent he was a good firefighter, it was from implicitly following an expectations targeting rule.